Is there reason to panic about the Tigers? No. But it would be naïve to believe the Tigers' recent struggles against playoff-caliber teams Oakland and Boston weren't telling. I'd still list the Tigers as the favorite to reach the World Series out of the American League, but it's hardly a given. That will be especially true if they aren't able to gain home field advantage. Boston and Detroit are both considerably above .500 at home and just five games above .500 on the road. Also, the Red Sox have navigated a tougher schedule than the Tigers this year because the AL East is much stronger than the AL Central. 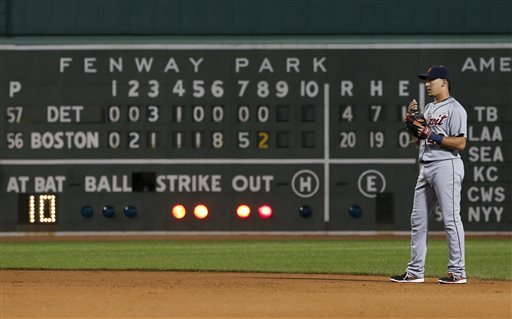 The Tigers were 2-5 in seven games against the A's and Red Sox. In the playoffs, that would mean they re out. They easily could have been 1-6 were it not for an improbable comeback vs. Oakland in the series finale. Oakland did hit the Tigers' vaunted starting pitching hard. 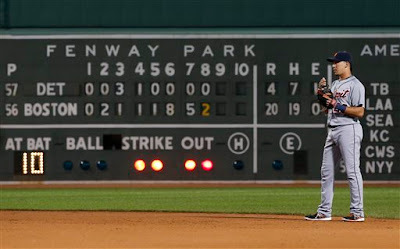 Boston's pitchers did shutdown the Tigers, although they feature a different lineup without Miguel Cabrera. We've known all along in this town the Tigers' bullpen is vulnerable. We've seen it lately, especially Wednesday in a 20-4 loss. simply must play better in the postseason than have recently or the playoff run won't be nearly as long as has been widely anticipated. I don't buy it. There's not a single Tiger pitcher from last night that will see the light of day in October. Pat, you're exactly right. The Tigers have all the ingredients to perform in the playoffs, good starting pitching, sound relievers, good hitting (a good run production and differential in runs scored vs. runs against) but they don't seem to produce against pressure. Might be unfair but I don't have a good feeling. Also the take vs. Leyland is that he seems to over-coach under pressure.